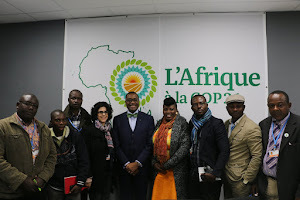 KUMASI, Ghana (PAMACC News) - Africa is expected to go into the UN climate talks in Paris this December with one voice and one position, to demand climate justice for the people on the continent. With the impacts of extreme weather conditions dawning on people and livelihoods, local farmers and communities will be looking out for a way out of their climate vulnerabilities. Africa is therefore emphasizing climate adaptation and finance to effectively deal with the effects of climate change. “For us in Africa, adaptation is the priority; climate change is already affecting our people, so if we have any emphasis, then it has to be on adaptation,” said Seth Osafo of the African Group of Negotiators (AGN). But mitigation is also being forced on developing countries, as evident in African countries’ Intended Nationally Determined Contributions (INDCs) to the UNFCCC. “It’s been pushed on us but we have to willingly say that we are also happy to embrace mitigation; but mitigation for prosperity, mitigation for development,” said Fatima Denton of the UN Economic Commission for Africa (UNECA), addressing the media at the close of the 5th conference on Climate Change and Development in Africa (CCDA-V). Africa has been regarded as the battle ground for competing global interest in the climate negotiations leading to the 21st Conference of parties (COP21). The European Union, for instance, seems to converge with the African Group in the areas of adaptation and finance but not on climate mitigation. It has been argued that Green House Gas emissions of some developing countries have dramatically increased over the last 10 years at such point that they are now among the biggest emitters in absolute terms, while the already high emissions of the industrialized countries have generally remained the same. At the 4th EU-Africa Summit in Brussels last year, climate change was among the main challenges discussed. One of the outcomes was a Declaration in which the European Union and the African Union reiterated their willingness to work together to fight climate change and to ensure that an effective agreement will be reached in 2015. “We believe that by discussing on the needs, challenges and priorities for Africa and by exchanging on our respective positions, we can be part of the process towards a satisfactory agreement in Paris,” said Cristina Vicente Ruiz, EU Delegation to the AU when she addressed CCDA-V. “The EU is looking forward to continue working closely with the African partners on Climate Change in the framework of our Joint Strategy to define, defend and implement our common interests”. The top priority for the EU going to the COP21 is also to secure a legally binding, ambitious and fair new agreement that will keep us on track below the 2°C objective. According to Mr. Osafo, getting a fair deal will require that African ministers going into the negotiations “be strong in putting forward the position of Africa”. Africa is already looking up to China as a partner to reckon with to become climate resilient. “We can identify areas where Africa desperately needs Chinese intelligence, technology and investment to advance in climate adaptation and mitigation,” observed Dr. Fatima Denton. “We can actually go on a partnership, building relationships where we can say Chinese can help support Africa’s renewable energy sector; Chinese can help in terms of building climate resilient infrastructure; Chinese scientists can help Africa in terms of moving smallholder farming into commercial agriculture”. China-Africa relations have often been analyzed in the light of a zero-sum game. But Dr. Denton says the climate partnership should not be based on a new kind of imperialism but a win-win partnership “whereby both China and Africa stand to benefit”.